Enjoy multiple indoor and outdoor living areas in this upgraded home. You will fall in love with the gorgeous backyard at Beach Town Cottage, one of our Signature Series homes. Fully fenced, this incredible outdoor living area is immaculately landscaped, dog-friendly (there’s even a dog run and dog door), includes Bocce ball and lawn golf, and the patio has a covered seating area with a fire pit and BBQ. Perfect for sipping morning coffee, the spacious front porch is stocked with seating and also features stunning landscaping. When you’re not relaxing, grilling or watching the kids play, a quick walk or car ride will take you to downtown Coeur d’Alene’s public beaches, parks, shopping, dining and entertainment. Located right by North Idaho College, you’ll have no trouble finding your way back after a long day of exploring. If you’re in the mood for an athletic adventure, you’ll also have easy access the Centennial Trail from this home. Indoors you’ll discover a multitude of living areas to gather or entertain. The upstairs offers a living room with plenty of seating, plus a separate cozy sitting area with a TV next to the sliding door to the patio. Head down to the den and you’ll find a second living room with another TV plus a queen sized sleeper bed. Multiple televisions allow the kiddos to enjoy their favorite cartoon while the adults unwind with a movie of their choice. Back upstairs you’ll enjoy preparing meals in the spacious fully stocked kitchen that’s complete with upgraded appliances. The long countertops provide more than enough space for a cook—and a couple of sous chefs. Just off the kitchen and adjacent to the living room is a dining table with seating for 8-10 and great built-in seating, providing a seat for everyone! This home is equipped with two full bathrooms, three bedrooms—plus the den’s sleeper sofa—accommodating nine people. Two of the bedrooms have queen beds and the third bedroom has a double and a twin. Handicap accessible, the first bathroom has a beautiful glass shower and the second has a shower/tub combo. You’ll also have access to a washer and dryer so your beach towels are always fresh. 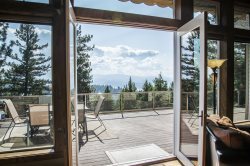 From taking in the ambiance of the incredible outdoor areas to taking a quick walk or car ride downtown, Beach Town Cottage will be a wonderful home away from home during your visit to this North Idaho beach town. • Guests are welcome to pick the berries and vegetables! Wonderful, Thank you for a wonderful place to enjoy family. The details that were covered were much appreciated. You all have been great to keep us informed throughout the process. The property was exceptionally clean and well kept and it was easy to leave from. The house was easy to find and quite nice overall. Very well furnished and functional for multiple family members. We had wonderful family dinners outside in the back yard as well as a nice quite morning coffee on the porch. Both outside areas are lovely as well as the inside of the house. The front door keypad is convenient for locking the door. If pressed for an improvement, there was no laundry detergent yet a request to clean towels prior to departure. Also, could use a bit more light throughout home. Otherwise, well stocked house with plenty of towels and nice beds/linens. We had a great time and thank you! Nicole was fantastic. I had hurt my back and was in a lot of pain. She dropped off a care package - it was so thoughtful and really set the tone for our stay. Every time I have contacted anyone they have been superb. Just needed help with taking out garbage since there was suppose to be 3 cans and there was only one, but we called and was taken care of. We were well pleased with our rental. It was comfortable with personal touches that helped us to feel at home. We were able to have our own space as well as be together in one place. The backyard has a private,entirely fenced yard with a wonderful covered patio, great landscaping and a grassy area for the kids to play along with outdoor games provided. We would definitely come back again. When I called I was actually very frustrated from a bad experience at another company! I must say the process was easy & pleasant from beginning to end! We were pleasantly surprised by the property! It was disturbing when we found the gardener in the back yard but we actually enjoyed talking with him & getting info on the house we were renting. He also was very helpful on the area! We found out that the lady who owns the house works at Fred Meyer! My husband also works at Fred Meyer in Tacoma, WA. Small world!